This mechanical watch combines luxury and mechanism together. High quality materials, Stainless Steel strap, with professional craft for durability. Suitable for both casual and formal occasions to wear. Premium stainless steel band, comfortable to wear. Self-winding mechanism, analog time display. Automatic mechanical movement, no need of battery. It&apos;s 30M daily water-resistant, but not for swimming, showering. 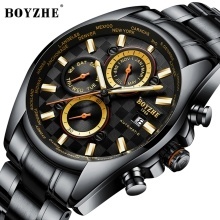 Convenient calendar, luminous function, classic Luxury men&apos;s watch design.